Make movies from camcorder, HD & common videos on Mac. Formats supported include: MTS, M2TS, HD AVI, HD MPEG-2/4, HD VOB, HD WMV, AVI, 3GP, M4V, MPEG, MP4, RM, RMVB, FLV, VOB, MPV, MOV, DAT, ASF, WMV. Make movies for devices such as: Mac, iPod, iPhone, Apple TV, PSP, PS3, Zune, Xbox, mobile phones, Wii & DS. Makes a movie in minutes on Mac. Clip & crop videos; add transitions, music, special effects. The ideal movie making software for your Mac, ImTOO Movie Maker for Mac is specifically tailored for Mac users and movie making buffs. This movie editor for Mac can make movies from all sorts of videos from your Mac. Nearly all video types and formats can be made into movies including camcorder (MTS, M2TS), high-definition (HD) (HD AVI, HD MPEG-2/4, HD VOB, HD WMV), and standard-definition (SD) videos (AVI, 3GP, M4V, MPEG, MP4, RM, RMVB, FLV, VOB, MPV, MOV, DAT, ASF, WMV). The created movies can be played on a broad variety of devices including the iPod, iPhone, Apple TV, PSP, PS3, Zune, Xbox, mobile phones, Wii, and DS. You can also share them on the web such as YouTube. ImTOO Movie Maker for Mac supports fast movie making, and also comes packed with movie editing features: video clipping and cropping, adding transitions, music, special effects. 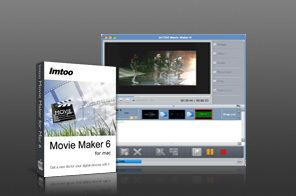 Download ImTOO Movie Maker for Mac for FREE! Turn video clips of different formats into Hollywood-style movies in SD/HD formats. Make movies from video formats including: MTS, M2TS, HD AVI, HD MPEG-2/4, HD VOB, HD WMV, AVI, 3GP, M4V, MPEG, MP4, RM, RMVB, FLV, VOB, MPV, MOV, DAT, ASF, and WMV. Trim video to retain the desired sections; convert the trimmed segments separately, or merge and convert them as a single file. Add a dozen of transitional effects such as Arrows Vertical, Clock, Diamond, Double Circle, Ripple, Mosaic and etc, also supports random transitions. This great movie editor for Mac lets you add music or even your own narrations to enrich your movie. Choose from a variety of artistic effects. Supports the newest iPhone 4. Makes movies playable on a range of devices including: iPod, iPhone, Apple TV, PSP/PS3, Xbox, Zune, PMP, mobile phones, Wii, DSi. Crop image frame to get rid of unnecessary logos, borders or anything else you don't need. Creates a movie copy every time an effect is added. The movie maker for Mac lets you preview the original and the edited video in real-time at the same time. Customize output parameters at will: bit rate, frame rate, sample rate, audio channel, resolution, codec and quality, among others. Interface available in several languages: English, German, French, Simplified Chinese, Traditional Chinese and Japanese. Mac iPod video converter to convert videos to iPod video and audio files.